This past August saw BlackBerry 10 users continue to quickly upgrade their OS systems to the newest version. 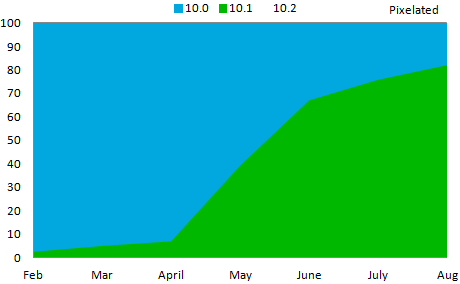 Use of 10.1 (or higher) is up across both Pixelated and Stuff I Need from the previous month. The Stuff I Need app showed 91.0% of users on the newest OS version, while for Pixelated the number was 81.9%. 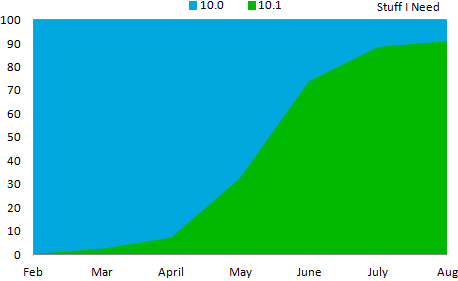 Given the aggressive rate of growth, and the large number of users that have upgraded, I think it is safe for developers to begin writing apps that require 10.1 as a minimum OS version. BlackBerry 10 is seeing an adoption rate of the new versions that the older BBOS never came close to. This data was collected by BlackBerry World for downloads of the free strategy game Pixelated and the free checklist app Stuff I Need. Data shown on the chart is from the beginning of February 2013 through the end of August 2013.